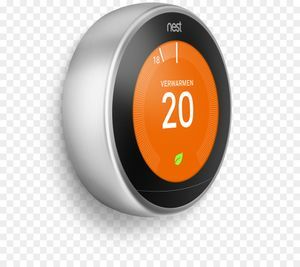 - However, the Nest thermostat E in the UK only(with heat link) is not currently supported by the Nest APIs. 6.8 Issue #8: I want to upgrade the code but I don't know how. The Next devices have required hundreds of hours of development & testing efforts to build, so a mandatory contribution is required to get the code. Technical support packages are also available. If you want to contribute more, here is the paypal link below. 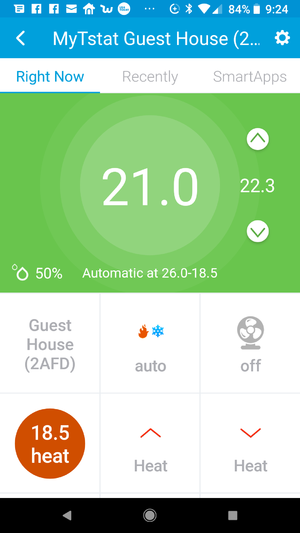 Nest thermostat operational & connected to Nest Backend via the internet. 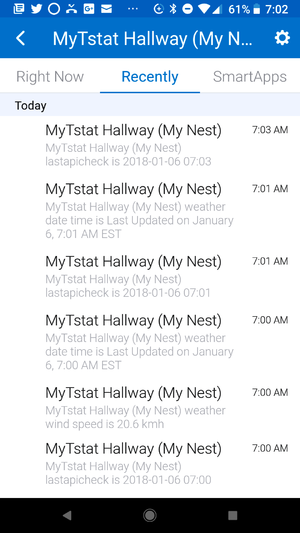 Be aware the Nest thermostat E in the UK only(with heat link) is not supported by the Nest APIs. Please refer to the Nest Developer APIs documentation for more details on each attribute. attribute "programScheduleName"        // indicate if a 'hold' or 'auto' setpoint adjustment has been made. // If made by a schedule at Nest, the value of programScheduleName  would be 'schedule'. Thermostat's Operating State appears when it changes. 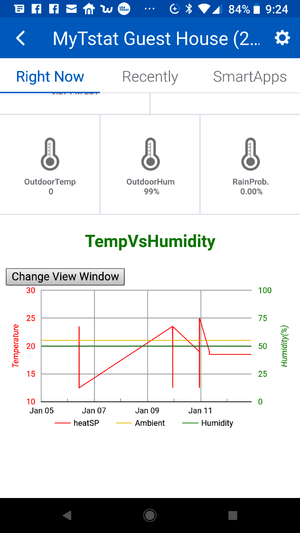 Google Graph that represents the thermostatMode,RoomTemperature,RoomDesiredTemperature,RoomSetpoint,HumidityLevel over a period of time (week, last 24 hrs). The button is used to change the view window (past week Vs. last 24 hrs). My Next Tstat uses the HTMLtile for rendering the graph. As ST is not supporting the HTMLTile, it may not work properly on all devices. This is a ST UI platform issue and not related to my code per se. Also, since v2.2.2 of the ST mobile app, most of the Android devices are now supported. b) Click on My Next Tstat, click on "simulator" on the right and the button under "API URL" as indicated below to launch the rendering. 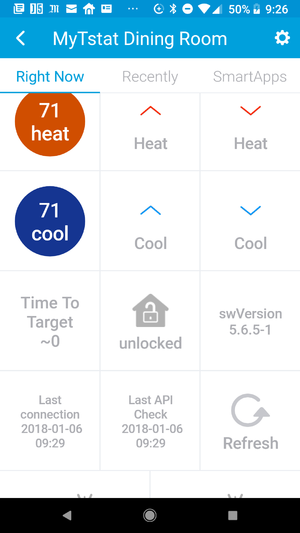 Please contact SmartThings support if you have any HTMLTile issues on your devices. In order to avoid querying the Nest APIs for the structure data and for better performances, some information is locally cached in the device. If you make changes to some stucture data and want to update the device immediately (by default, it's done once a day at midnight), please manually press the "refresh" tile. If you get a blank screen after pressing 'Next or you get the following error: " Error - bad state. Unable to complete page configuration" or any other ST errors, please check that you've enabled oAuth as specified in step 2f) in the readme. First try to refresh the UI by pressing the 'refresh' tile. The ST UI does not allow automatic refresh at the moment. Please note also that the cloud-to-cloud integration may introduce some delays in getting the latest values. 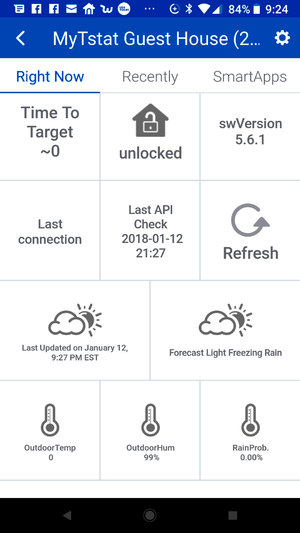 'Like any ST connected device, you need first to unselect all your Next devices from all the smartapps & routines as MyNextManager will not uninstall w/o doing this step. MyNextManager is the Service Manager for all Next Devices, so uninstalling the smartapp means that all Next devices will be deleted. Do not forget to remove the trace (leave the parameter blank) after your debugging session as this setting may impact performance. Under the IDE, to activate live logging, just click on the link below (or the variant according to your shard). You can also edit the device's preferences under the ST mobile app by clicking on its 'gear' button. Note: To filter the logs for a given device or smartapp, you need to click on its name in the upper section of live logging. This filtering should be done before submitting any logs for analysis. Issue #8: I want to upgrade the code but I don't know how. Most of the time (unless specified otherwise), you just need to copy and paste the MyNextTstat Device's code from the the related txt files, and save & publish. The same approach should be used for the smartapps. ST has introduced some generic rate limiting rules for all smartapps and device handlers. These exceptions are thrown by the ST backend from time to time. I've been told that ST is working on it. This is not a specific issue with my code. 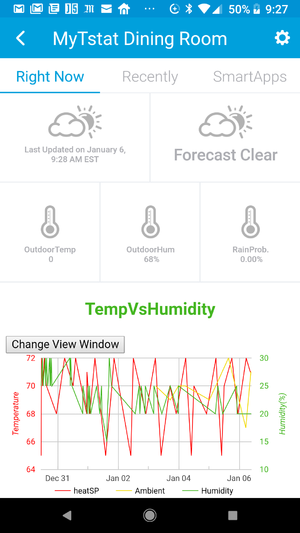 The temperature scale needs to be changed for your ST account under the ST Mobile app, so that all your ST devices will be in the metric system. Press the "hamburger" menu (upper left), and then the "gear" icon. 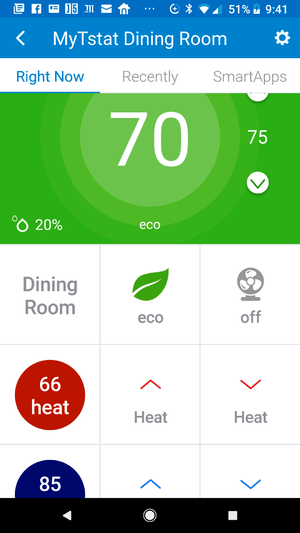 You'll find the option to change the temperature scale there and press "save". At the next "refresh", My Next Tstat will display the values in the metric system. P.S. If you use the new Samsung app, you may have to press refresh tile and the up and down arrows in the ST classic app to force a refresh of the values under the new Samsung app as the app has a different cache than the ST classic app. No custom DTHs can be created under the new Samsung app for the moment as indicated in the prerequisites. You'd need to use the ST classic app to execute MyNextManager in order to create the Next devices. After creating the devices, follow the steps indicated in the installation pdf file included in the zip to force a refresh of the cache in order to make them appear correctly in the new Samsung app. If some of your Next devices are disconnected under the new Samsung app, you may have created many of the same devices by executing MyNextManager too many times... Under the new Samsung mobile app, you then need to clean them up by pressing the "edit" button next to your location and removing them. This page was last edited on 25 March 2019, at 09:31.